Those three single country funds are for South Korea (EWY), Taiwan (EWT), and New Zealand (ENZL). The data is sorted according to the composite valuation, which is the average of the relative valuation for Price/Dividends, Price/Earnings, Price/Book, Price/CashFlow, and Price/Sales. Relative Valuation in this study is the valuation multiple for the ETF divided by the valuation multiple for total US stocks (as represented by VTI). All of the other metrics are also relative calculated in the same manner. The upper panel of the chart plots the trend rating over time with rating of 100, 50 or 0. 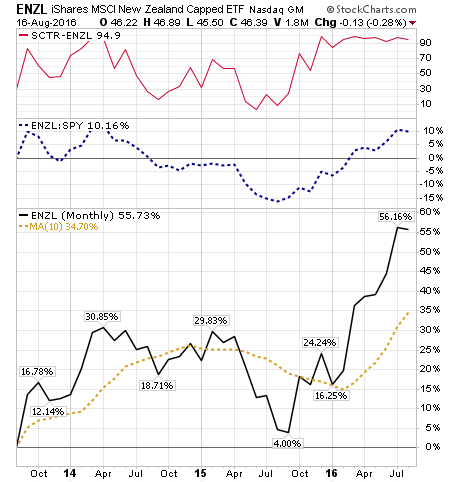 These are additional charts made with StockCharts.com; shown the monthly price performance, 10-month moving average, ratio of the ETF performance to SPY (the leading S&P 500 proxy), and the Stock Charts Technical Rating (“SCTR”). 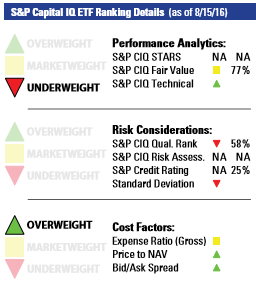 The upper panel in red is the technical rating. 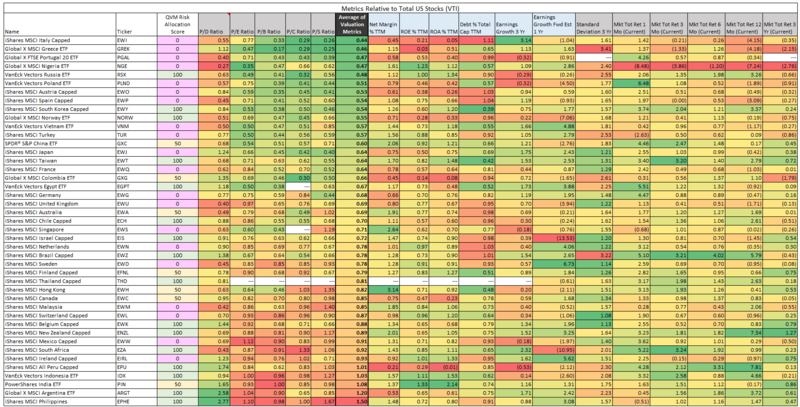 The middle panel in blue is the performance relative to the S&P 500. The main panel shows the monthly performance and the 10-month moving average. 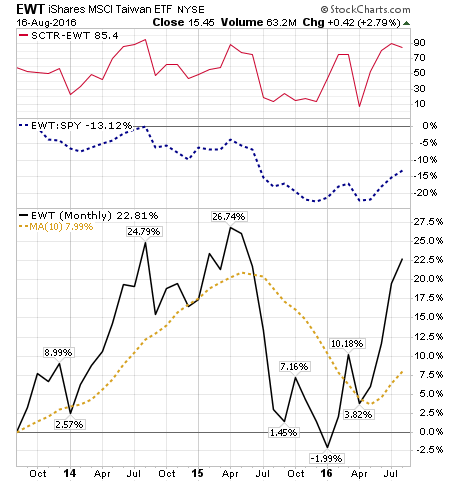 The South Korea and Taiwan trends are developing, and the New Zealand trend may be peaking or ready for a pause, based on the StockCharts technical ratings. 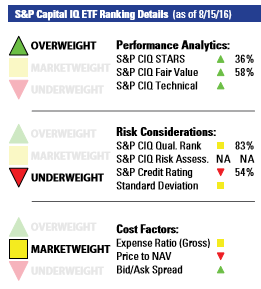 BarChart technical ratings differ. 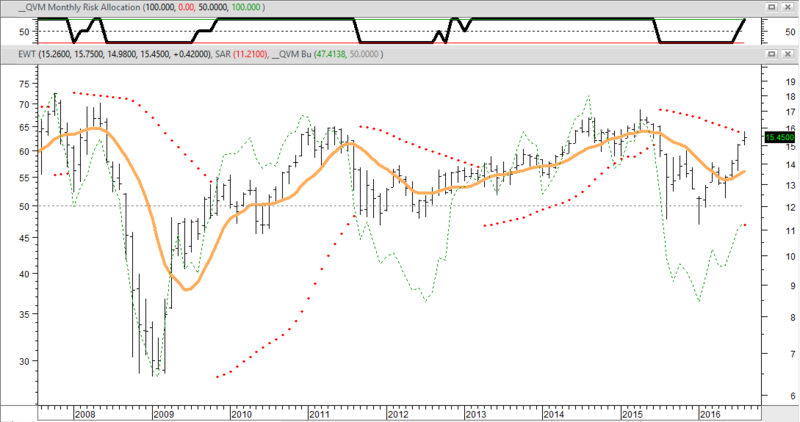 They see Taiwan as being the weakest Buy with the weakest trend direction. They see Korea and New Zealand as strong Buys. 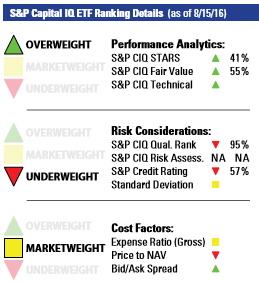 S&P ranks the top 25% of the ETF universe as Overweight, the middle 50% as Marketweight, and the bottom 25% as Underweight. South Korea and Taiwan are heavy in tech, with little or nor real estate or energy. New Zealand is more balanced with highest concentrations in communications, healthcare and utilities, with no financial services and light on consumer sectors. They are all in the Asia/Pacific region. 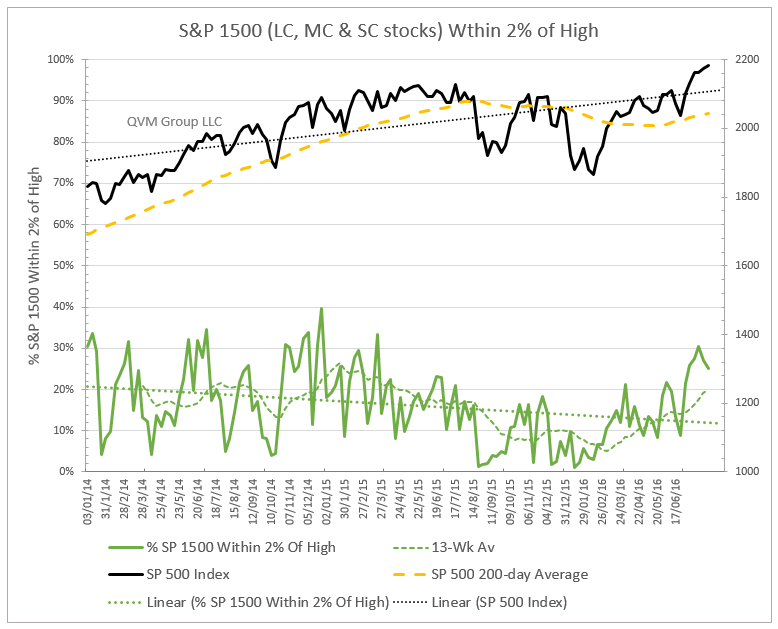 As additional information, the table provides the price percent below the 12-month high price; the price position within the 12-month high-low range, the overbought or oversold condition based on the money flow indicators, the positive or negative signal from the MACD signal line, and whether the MACD is above or below the center line. 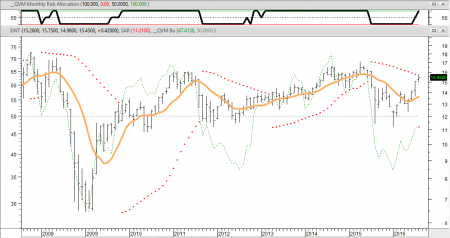 Even though current trends are up, the Bull is aged and probably in late stages, with significant long-term risk associated with eventual withdrawal of central bank market distortions. Cautiousness and conservatism is warranted. Fear of loss and risk avoidance are important emotional and behavioral factors that are about twice as strong as satisfaction with gains and opportunity seeking emotions and behavior. That gives us some pause talking about long-term risks. 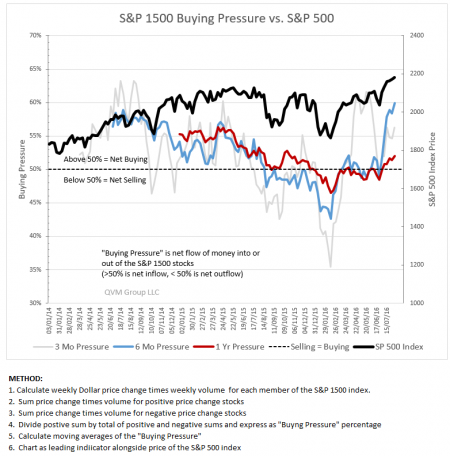 We do not want to frighten anybody or cause them to, as Jeff Gundlach said, “Sell Everything”. Market performance problems that are certain to be upon us someday are not upon us now, and within reason, we must take advantage of current positive trends. But we want you to be aware of the nature of the problems that will most certainly be realized some uncertain time in the future. There are important setups of valuations that are too far from long-term mean levels to be permanently sustained, and that are the basis of multiple institutions cautioning investors of subdued returns over the next decade. 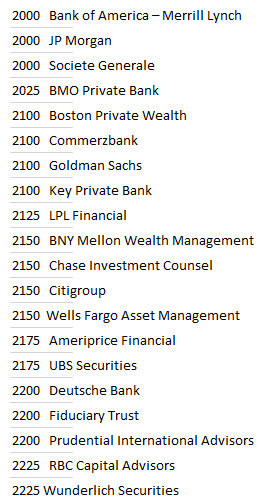 In June a survey of institutional investment strategist saw the S&P 500 ending 2016 at around 2100 to 2200. We are pretty much there now, suggesting not a lot of upside over the remainder of the year, which also dovetails with the likely reluctance of investors to be fully exposed to market risk during this unusual presidential election. We have been in the Great Distortion for years now, and “mean reversion” can gettcha if ya don’t look out. 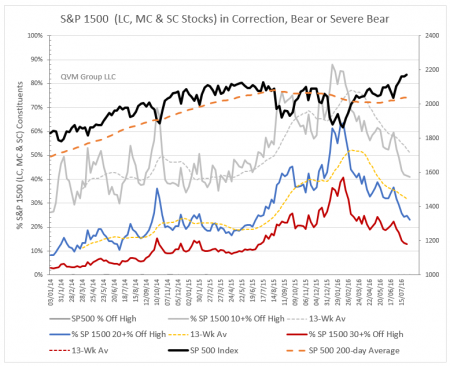 Unfortunately, while mean reversion is a near certainty, when reversion takes place is not. Wide deviations from “normal” levels can go on for long periods (but can also revert quickly). Our central bank and those of Europe, Japan and China have been doing things to prevent mean reversion for years now. Someday the forces of mean reversion will defeat the central banks if the banks don’t toss in the towel on their distorting efforts first. Before a general look at overvaluation and mean reversion in the S&P 500, here from 720 Global is one of the worst cases today of yield chasing that has put utilities into rarefied territory with very strong mean reversion risk. 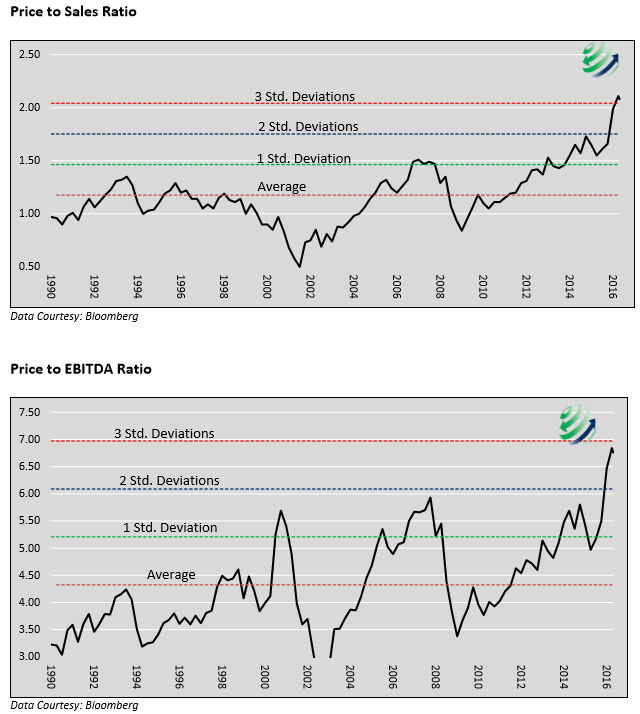 The image below shows the S&P 500 sector ETF (XLU) Price-to-Sales ratio is more than 3 standard deviations above its average since 1990; and the Price-to-EBITDA ratio is nearly 3 standard deviations above. 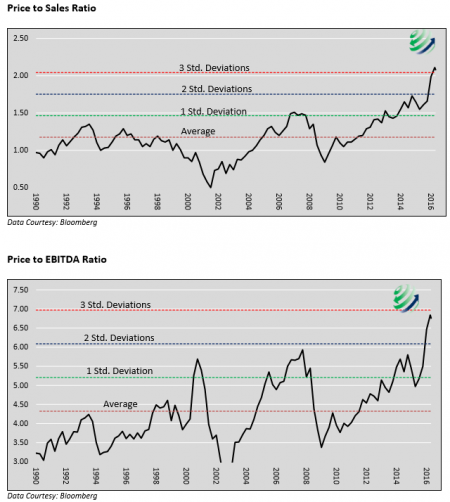 Valuations 3 standard deviations from the mean have odds stacked well against them being sustainable. The price would be cut in half to get back to average Price-to-Sales ratio, or cut by about one-third to get back to average Price-to-EBITDA. That is not an attractive risk for a slow-growing industry. This problem caused by the frantic search for yield that has raised the price of typically high yield or strong dividend growth companies to unattractive valuation levels. The need eventually to move valuations back toward the mean levels in key asset categories is the reason so many forecasters see muted portfolio returns in coming years. The current trends in US stocks, and bonds are up right now, which is itself unusual as a pair. They are all marching to the tune of ZIRP and NIRP (zero interest rate policy and negative interest rate policy), which cannot go on forever – a long-time yes, but not forever. When rates normalize (revert to mean), so too will stocks and bonds. Interest rates are at the base of most aspects of investing, and tend to drive valuation of other assets. Having some idea what normalization would be is important to setting expectations. 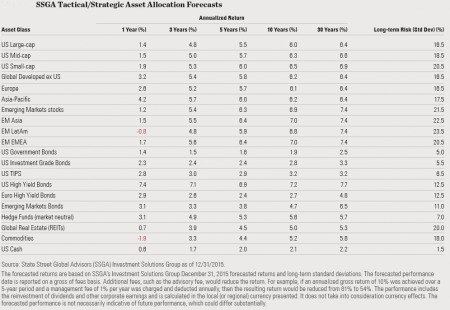 A wide variety of institutional voices have concluded and published their expectation of lower portfolio returns over the next several years, as a result of the significantly above normal returns of the past several years. They talk of interest rates rising, profit margins declining, revenue growth slowing or not accelerating, valuation multiples compressing, debt servicing costs rising, reduced stock buybacks resulting in less boost to earnings per share, and just general world GDP slowing or moderation. 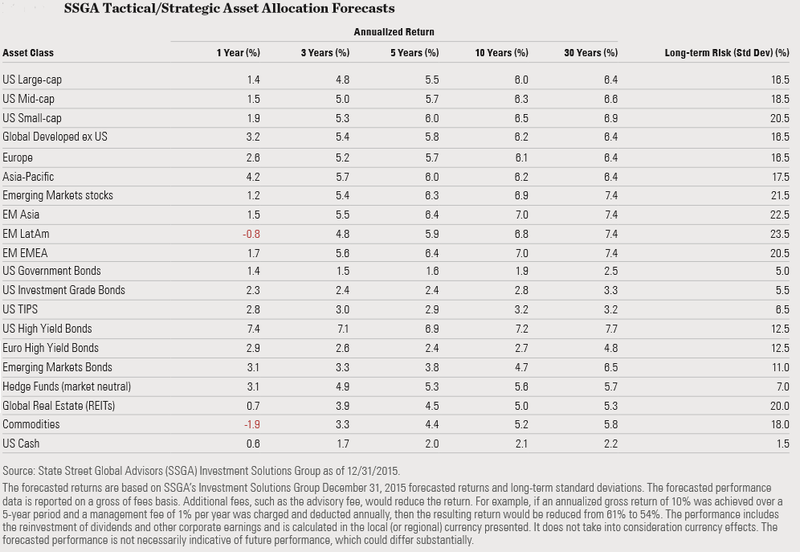 Looking across their prognostications and generalizing, it seems they expect a 4% to 5% total return over the next 5 to 10 year for a 50/50 stock/bond balance portfolio. In May of this year McKinsey & Company published a report titled “Diminishing Returns: Why Investors Need to Lower Expectations”. They see much lower asset returns, and therefore lower portfolio returns, in effect due to mean reversion. 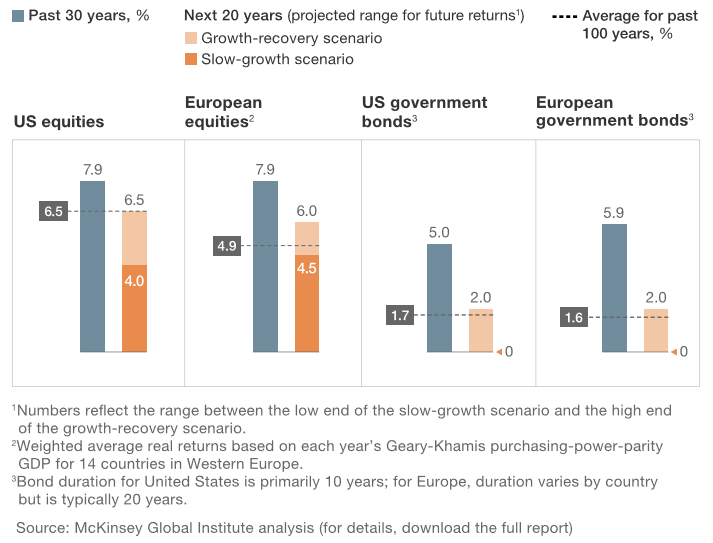 Based on the mid-point of McKinsey’s view a 50/50 US stock/US bond portfolio would tend to return an approximate 5.25% nominal annual return over the next 20 years. BlackRock sees similar lower asset returns. Based on BlackRock a 50/50 US stock/US bond portfolio should expect a long-term nominal annual return of about 2.55% over the next 5 years and about 3.5% over the “long-term” (undefined length of time). Based on Vanguard’s view a 50/50 US stock/US bond portfolio would tend to generate a 4.5% annual nominal over the next 10 years. Based on JP Morgan forecasts a 50/50 US stock/US bonds portfolio might expect an annual nominal return of 5.63% over the next 10-15 years. By interpolating/hypothesizing perhaps a 3% aggregate bond yield from Northern Trust comments, a 50/50 US stock/US bond portfolio may generate an annual return of about 4% over the next five years. 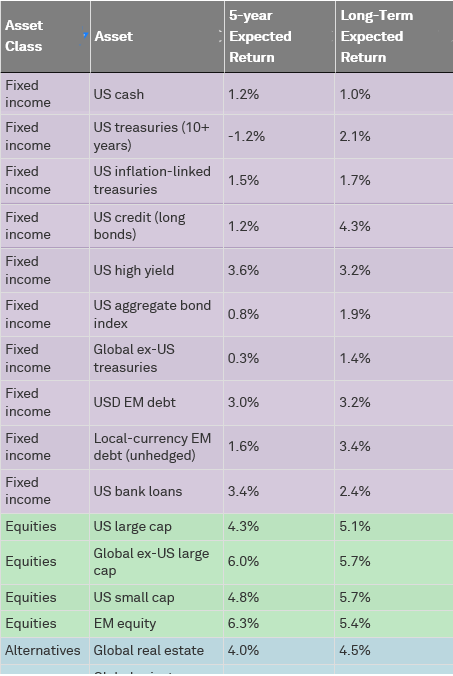 Goldman Sachs “Last Innings” 5-year nominal return assumptions. Based on Goldman Sachs forecasts, a 50/50 US stock/US bond portfolio (it’s a little hard to say because they do not specify US aggregate bonds or investment grade bonds), but let’s take the mid-point between their cash return and high yield return (2.5%) and tweak it up to 3%. That would give a possible 5-year expectation of about a 3% nominal portfolio return. Based on Research Affiliates forecasts a 50/50 US stock/ US bonds portfolio would generate about a 1.1% real return (perhaps 3% to 3.5% if inflation were to be in the range of 2% to 2.5%) over the next 10 years. 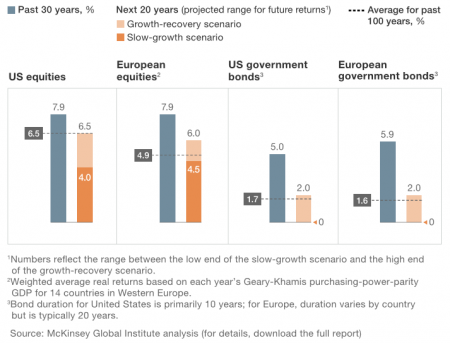 HOW MIGHT WE LOGICALLY GET TO LONG-TERM EXPECTED PORTFOLIO RETURNS? 50% x 5% + 50% x 3% = 4% portfolio return. A 70/30 stock/bond portfolio with the same underlying asset returns would return 4.4% (70% x 5% + 30% x 3%). A 30/70 stock/bond portfolio would generate a 3.6% return (30% x 5% + 70% x 3%). 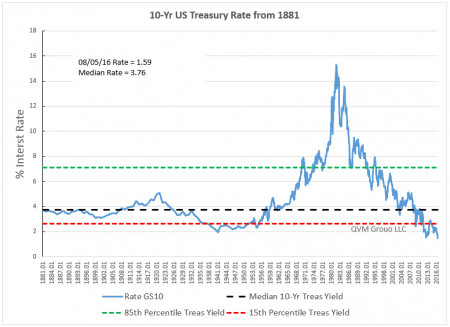 One way to potentially do better is to own stocks that pay more than 2% (index level) yield and that are not terribly interest rate sensitive, and that can grow earnings (and revenue) at least at 3% over the next 5-10 years – to get more of the return in regular cash with less reliance on price change. A third way could be to have a non-core tactical component of the portfolio that, if successful, could outperform the core. 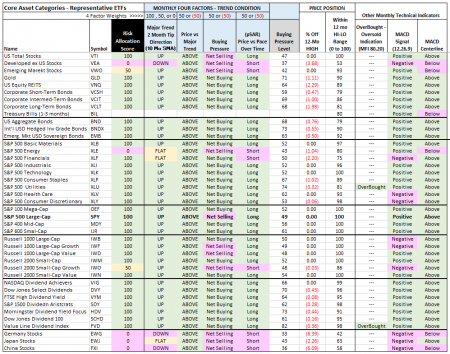 In great part, long-term assumptions come down to reversion to the mean whether analyzing core portfolios, or tactical opportunities — so let’s look at some prime examples of assets far enough from their mean that significant value changes are in store, when the forces of Great Central Banks Distortion are withdrawn. Before the mean reversion sets in, there needs to be some sort of catalyst. Central banks are expected to provide that catalyst in one way or the other, either by raising rates, or cutting rates with minimal intended effects. Another catalyst could be investor recognition of obvious problematic divergences. Figure 1 shows an important problematic divergence. 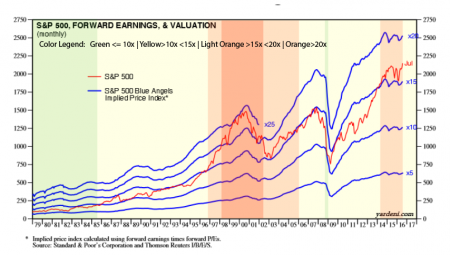 The S&P 500 price is in black and its reported GAAP earnings are in red. 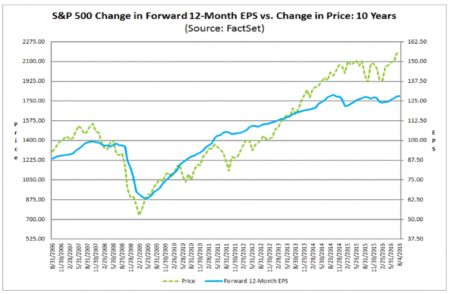 Trailing earnings are falling and the price of the index is rising. That is a divergence setting up for a reversion to the mean (unless of course earnings catch up with the strong price rise). 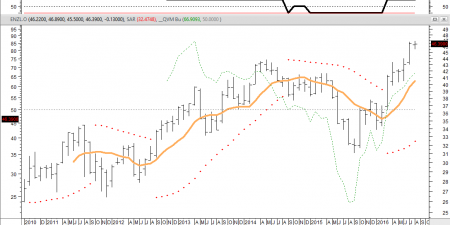 Note that the last two time earnings declined for several quarters, the stock index declined significantly as well. This is a cautionary signal. Figure 2 shows a problematic divergence based on forward operating earnings similar to the one in Figure 1 which is based on trailing GAAP earnings. S&P 500 forward operating earnings expectations are relatively flat, but the price of the index rising significantly, This divergence is not normal and sets up for a reversion to the mean (a return to a normal relationship). This is a cautionary signal. 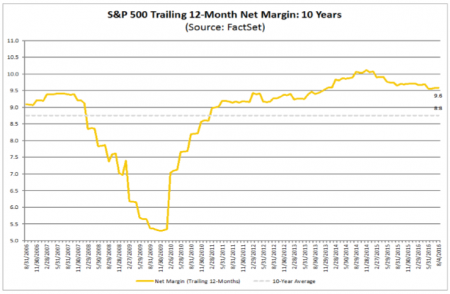 Figure 3 shows that not just earnings, but also profit margins are in decline, and are also above their long-term average. 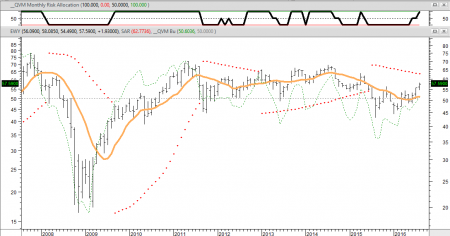 This is a set up for return to the mean, which would be a negative for the S&P 500. 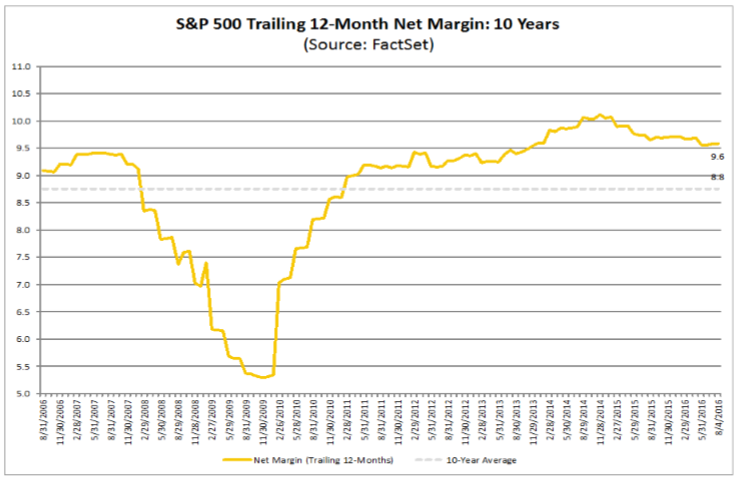 If all other valuation factor remained constant, profits (and presumably prices) would come down 8.3% for profit margins to reach their 10-year average. Figure 4 shows aggregate public and private corporate profits as a percentage of GDP. There are way out of line with the norm. This is a setup for return to the mean, in a way that would reduce stock returns going forward. 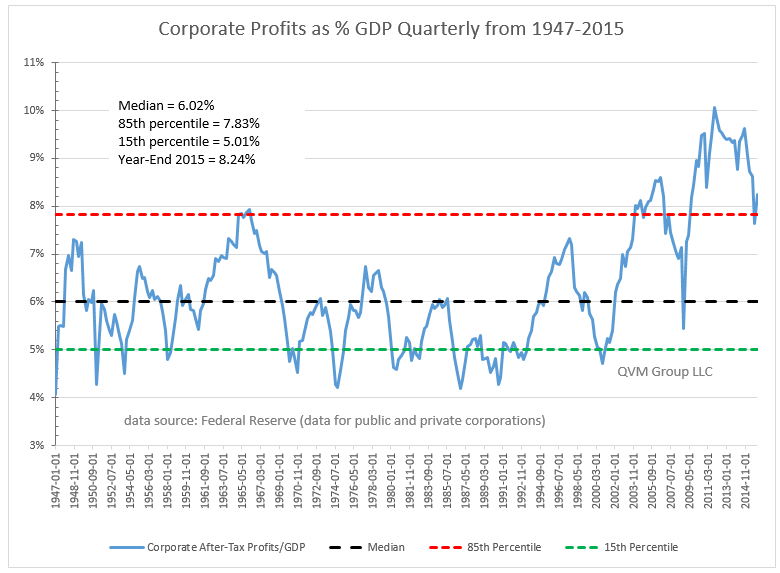 If all other valuation metrics remained constant, the value of American corporations would decline by 27% to reach the mean profits to GDP ratio. Note the use of the 85th and 15th percentiles as indicator lines. When at the 85th percentile, there is 6 times more room below than above that level (5 times to the 15th percentile level); and at the 15th percentile, there is 6 times more space above than below (5 times to the 85th). Price-to-earnings ratios are the most popular metric. 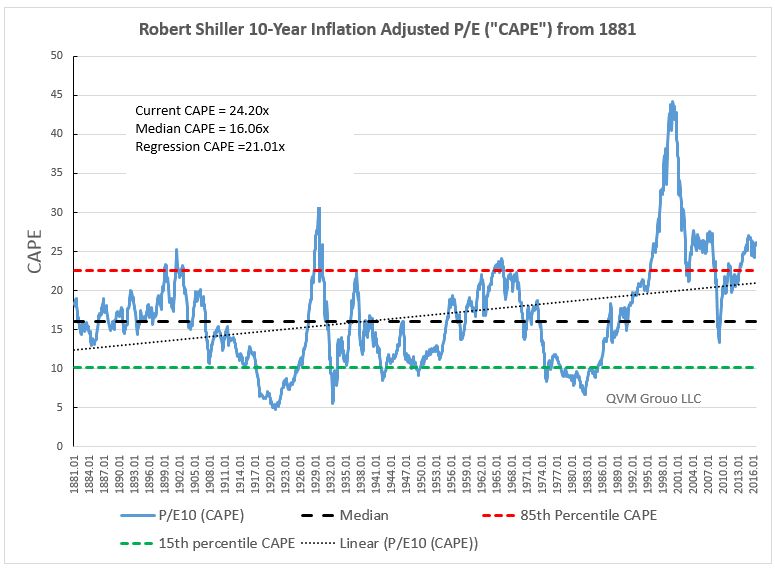 Figure 5 shows the Shiller CAPE ratio (an inflation adjusted 10-year average reported GAAP P/E ratio). If all other valuation metrics remained constant, the price of the S&P 500 would have to decline by 33.6% for the CAPE to reach the mean. 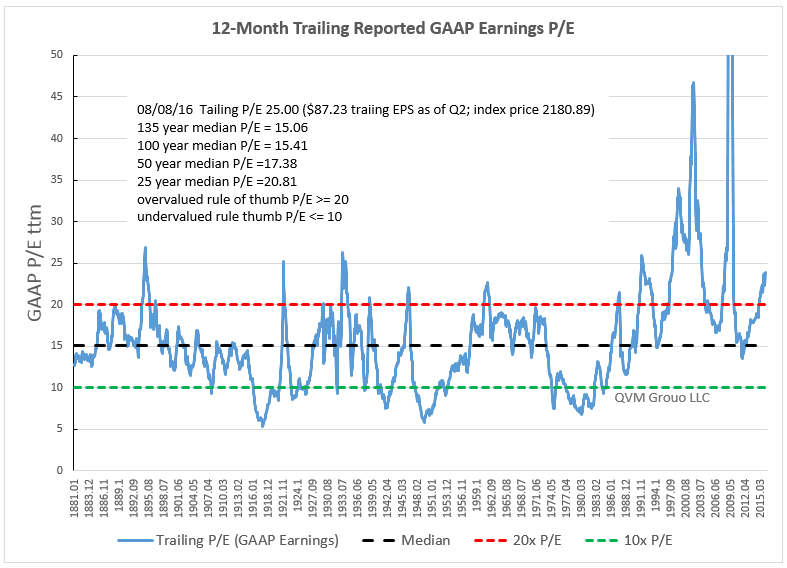 Figure 6 shows the P/E ratio based on the 12-month trailing reported GAAP earnings. It too is way above normal and set for mean reversion. Such elevated P/E ratios may be justified in the short-term due to exceptionally low interest rates, but when rates eventually rise, as they must, the math used to set reasonable P/E ratios adjusts, and lower P/E multiples will be in order. Note that much of the increase in price in the past few years has been due to multiple expansion and not to underlying organic growth of the companies. When interest rates rise, some of those stock multiples must be given back. To revert to the 25-year median, the S&P 500 would have to decline by 20% at the current earnings level. To revert to the 135-year median, the S&P 500 would have to decline by 40%. 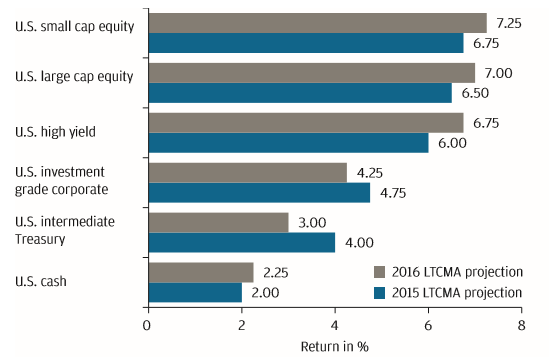 Figure 7 shows the P/E based on forward operating earnings. 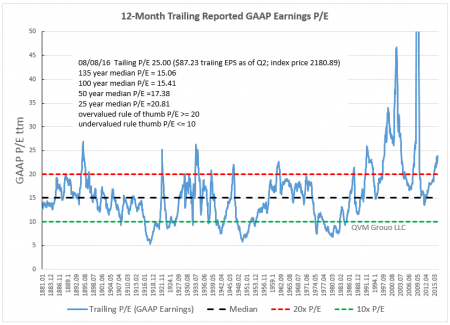 Like the 10-year inflation adjusted GAAP P/E, and the 12-month trailing GAAP P/E, the forward operating earnings P/E is also well above its average. To revert to the 10-year average, the S&P 500 would have to decline by 16%. 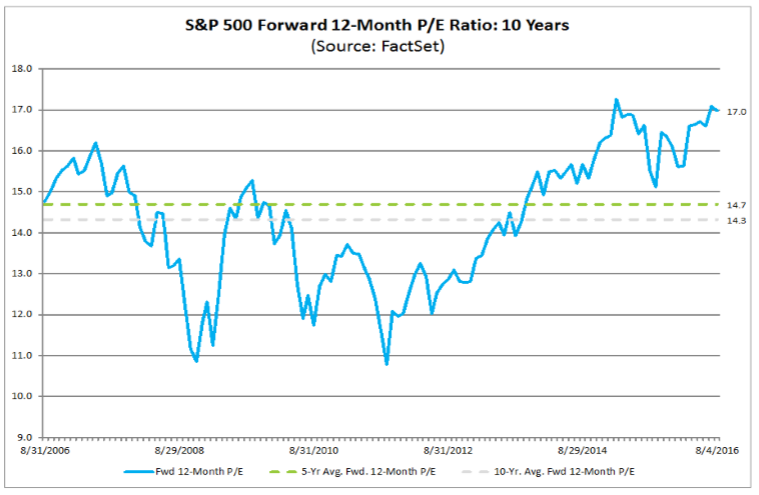 Figure 8 provides a much longer view of the forward P/E ratio (courtesy of Dr. Ed Yardeni, Yardeni Research inc., http://blog.yardeni.com). Here he has plotted P/E isobars, representing what the index price would be at different P/E levels for the forward earnings view at the time. We added the color shading to make it a tad easier to see stages of valuation at different levels. This chart plots from 1979. 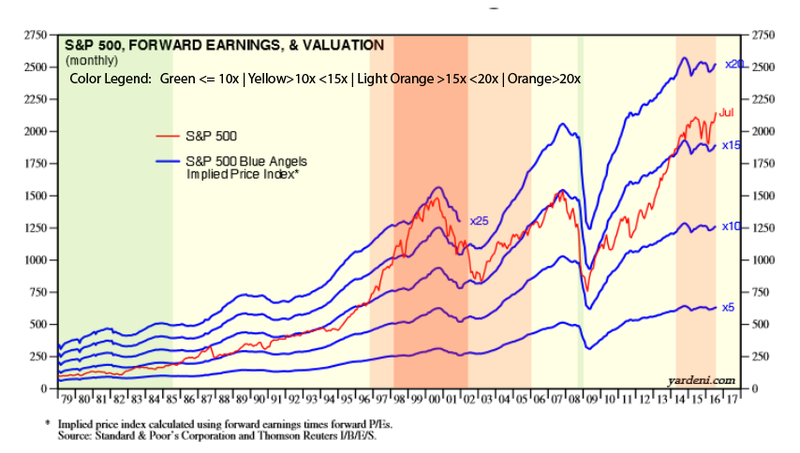 You can see that the current forward P/E is in the elevated range (light orange) between P/E 15 and 20. That suggests mean reversion vulnerability. Really it is easier to think of stock valuation relative to interest rates by expressing stock valuation as an earnings yield versus a Treasury bond yield (yield-to-yield, instead of P/E-to-yield). 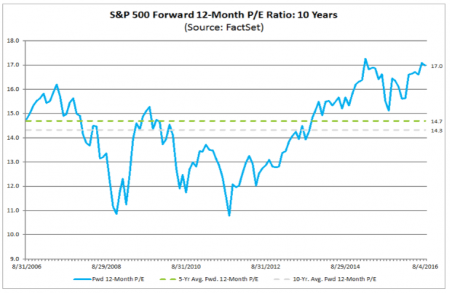 Earnings yield is simply the inverse of P/E. Instead of P/E it is E/P. 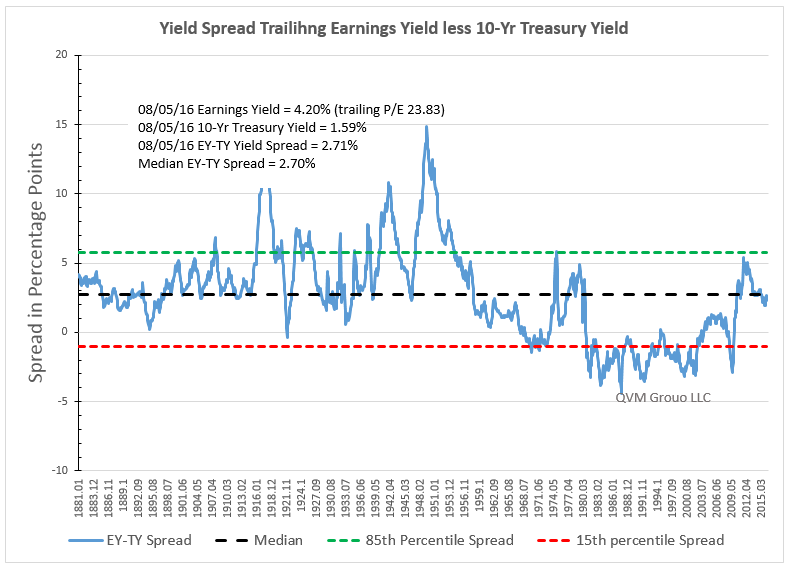 Figure 9 shows the earnings yield (“EY”) of the S&P 500 for the past 135 years versus the US 10-year Treasury yield (precursors of S&P 500 before 1957 and precursors of 10-year Treasury in early years, based on data assemble by Dr. Robert Shiller of Yale). 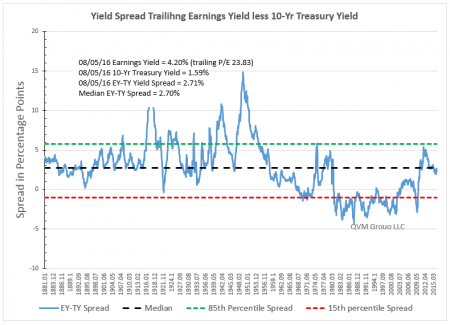 As it turns out the earnings yield is just about right at the median level, meaning the index is properly priced for the current interest rate situation. But the current interest rate situation isn’t priced right and has to change eventually, possibly sooner than later. At that time, the S&PP 500 would be overpriced and prone to price reduction. 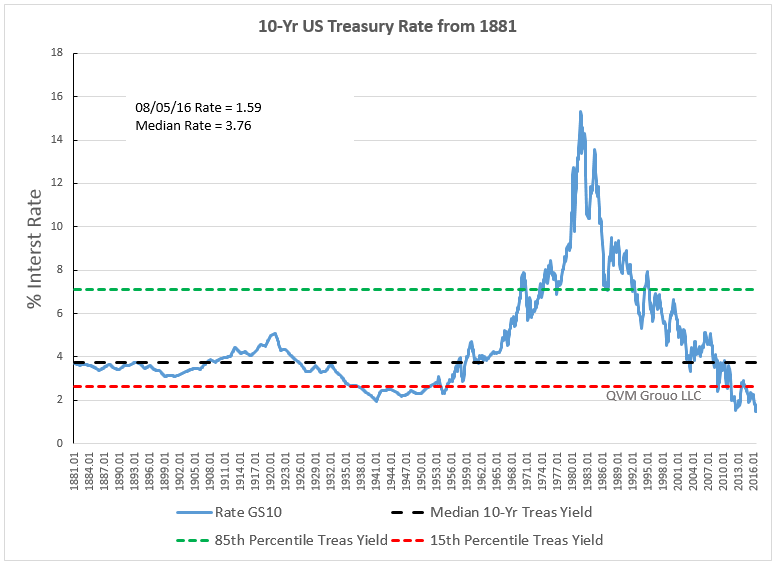 Figure 10 shows the US Treasury 10-year rate and precursors back to 1881 (135 years). The recent rate is 1.59% and the median is 3.76%. It has been all over the yield range for the past 60 years, showing its can go much higher under some circumstances. But it is currently at the lowest rate in 135 years, which suggests the only logical probability is up (even if down more for a while). When rates rise, all other investments will make adjustments for the relativities to this theoretically zero credit risk vehicle. As it approaches mean level (or shoots past the mean). 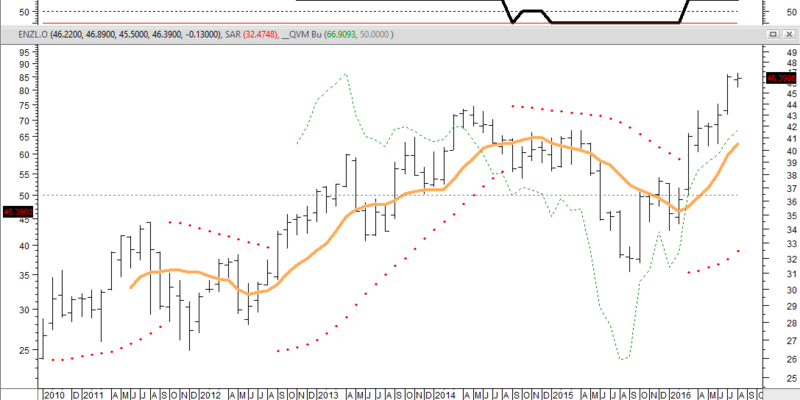 Mean reversion will be the name of the game for other assets too. 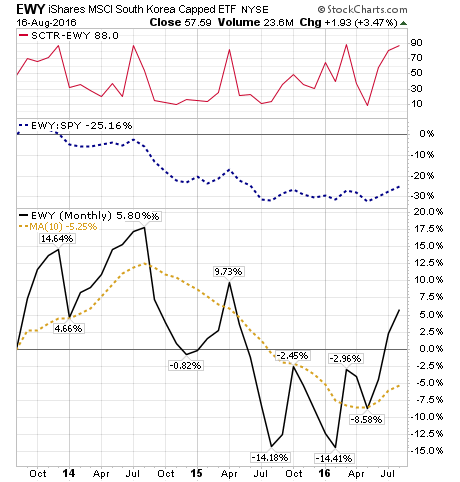 Back to the present, the breadth damage done in the second half of 2015 and the first quarter of 2016 is healed, and breadth indicators support the current rally. 3-month (gray), 6-month (blue) and 1-year pressure within the S&P 1500 is net to the Buying side and rising after a long period of decline and into net Selling territory in 2014 and 2015. 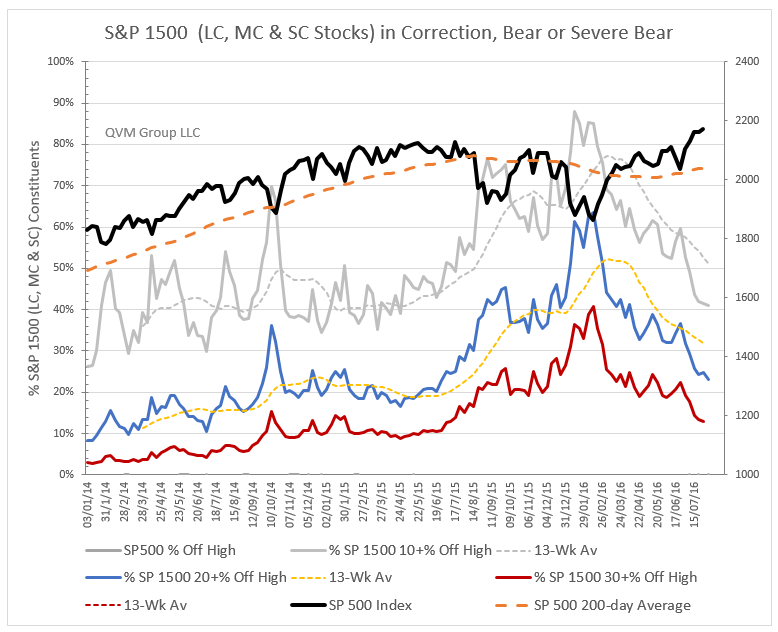 The percentage of S& 1500 stocks in Correction, Bear or Severe Bear condition has returned to pre-Correction levels and is improving. 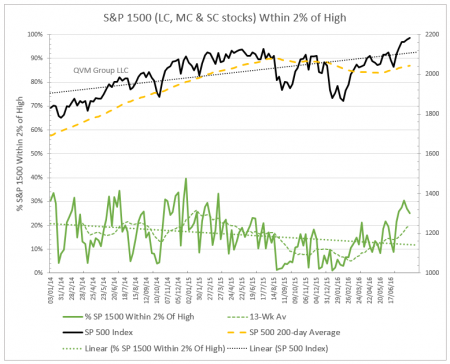 The percentage of S&P 1500 stocks within 2% of their 12-month high is in good shape.